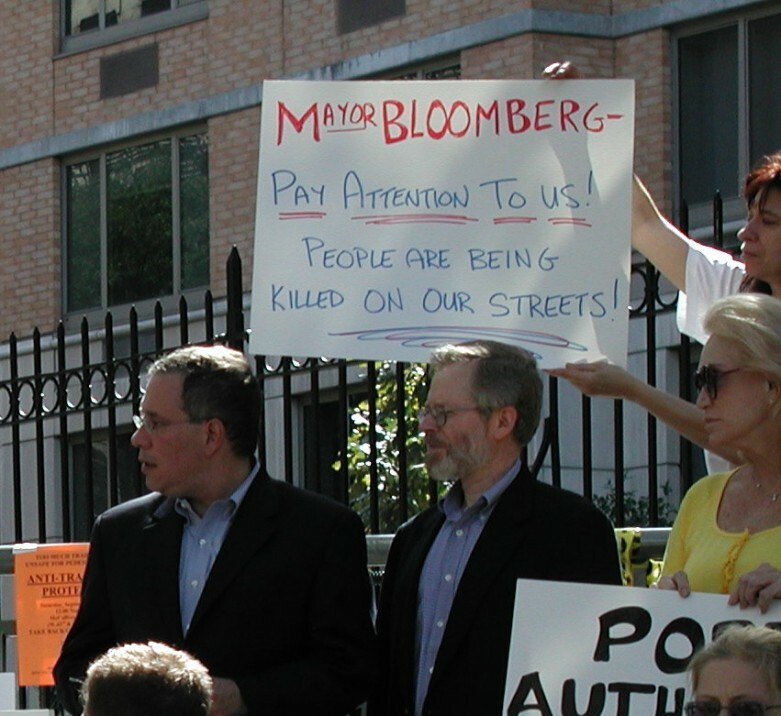 Clinton Hell’s Kitchen Chelsea Coalition for Pedestrian Safety (CHEKPEDS) was founded by residents and community leaders in September 2005, to reclaim 9th Avenue from the hellish Lincoln Tunnel traffic . The coalition is growing rapidly with Businesses, Institutions and Property Owners joining in to correct the dangerous conditions in the neighborhood : pedestrians risk their lives crossing the streets, children cannot safely walk to schools; residents cannot breathe or sleep; public transportation is ineffective; local stores experience slow and costly deliveries; personal safety is at risk. Watch the Video. Many local improvements sought by the coalition can only be achieved through city-wide or state-wide policy changes. The coalition works closely with advocacy organizations to effect such changes. 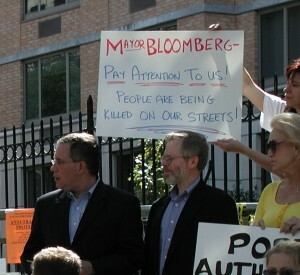 Read the May 2006 coalition’s letter to Deputy Mayor Dan Doctoroff and his response. 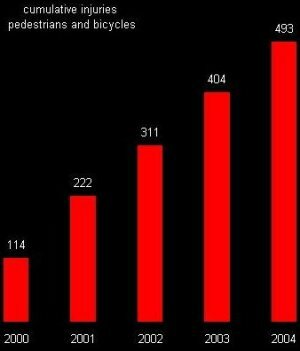 there were over 500 pedestrian injuries in 5 years on 9th Avenue. Eleven intersections have become two to three time more dangerous. Holy Cross is the most dangerous school for children to walk to in Manhattan. EMS and FIRE vehicles cannot go through . We have 25% more deaths from chronic lung diseases than in the city overall. In fact there has been a 71 % increase in complaints about the air quality in 4 years . Feathering down of traffic on 9th Avenue. Remove postal trucks from 9th Ave.
Traffic controllers at 42nd and 9th Ave.
Traffic controller at 40th and 41st Streets. Traffic controllers at 37th and 9th Ave.
CHEKPEDS is a New York State Charity and a 501 (c)(3) . Hi. 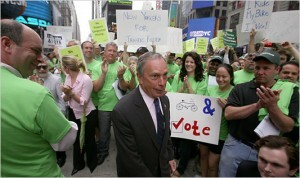 Revolution Rickshaws would like to join Chekpeds for 2011 and participate in creating a safer neighborhood. How do we do so? one urgent project is to promote safe and lawful driving by cyclist. do you have policies, tee shirts etc.. that we could disseminate in the neighborhood? We will start at 22nd and (if everyone is game, make a side trip to 23rd and 7th to Kent’s gardens) then proceed South to 17th and Eighth then over to Ninth Ave and stroll north up as far as Cynthia’s pit at 30th then back to Eight Ave and down finishing at 23rd. Thank god for CHECKPEDS! I felt so alone and powerless, suffering from the noise pollution and air pollution in Hell’s Kitchen. I breath in the toxic air and wonder how long it’ll be before I’m diagnosed with cancer! I listen to the incessant honking and the roar of the trucks and taxis and buses and suv’s and wonder if I’ll go mad from all the noise!!! It CAN AND MUST be solved and I plan to join you to fight this atrocity. I just nearly got run over while crossing ninth Avenue and 43rd St. with my daughter in her stroller. I was SO UPSET. A woman named Julie from Manhattan Plaza apartment building gave me your website. She was so supportive and kind, as I was very shaken. I would love to get involved In your organization, especially since I run the Hells kitchen moms and dads group which is about 450 members at the moment. And becoming more active by the day!